Sokonicheskaya Zastava Square has been a very popular place since 19th century, mainly because of the large forest Sokolniki with cosy alleys, nice lakes and clean air. 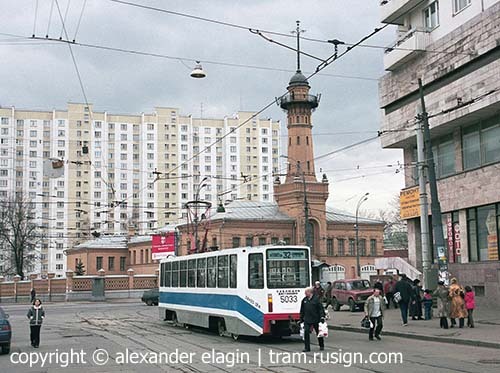 The first horse-drawn tramcar came here in 1875, only three years after the first street rail line had been constructed in Moscow. 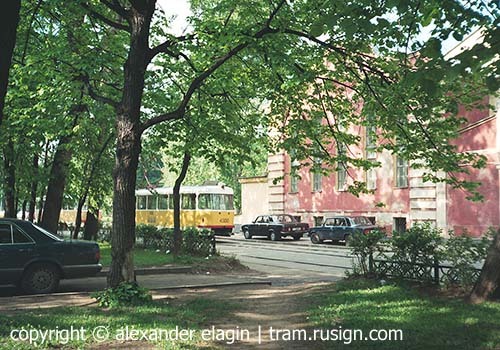 Later the tracks were moved a little away from the main road, and today tramcars run along the tracks constructed in 1953. This district, once a suburb of Moscow, has been reconstructed during the last two decades, and today it looks rather ugly with its standard block architecture, although it preserves the clean air from the forest, untouched by construction. 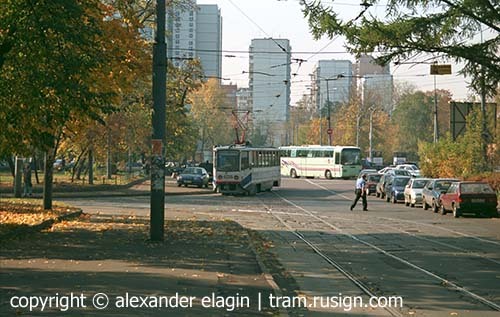 The line branches towards Sokolniki from the trunk line along Rusakovskaya Street. Once upon a time the fire tower was the tallest building of the district, but now it looks depressed by modern blocks. Sokolnicheskaya Zastava terminus. 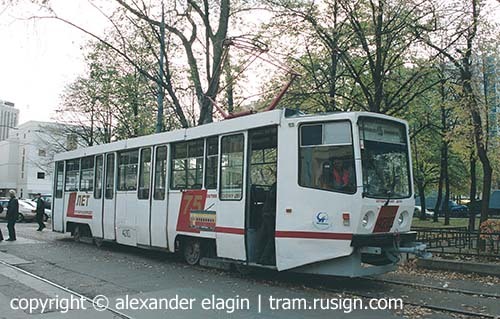 This route 45 tram is having a short break before departure. 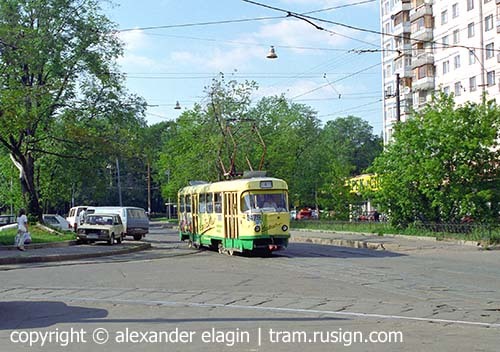 Route 45 returned hither in 2002 after a 5-year break caused by reconstruction of Krasnoselskiy overpass. 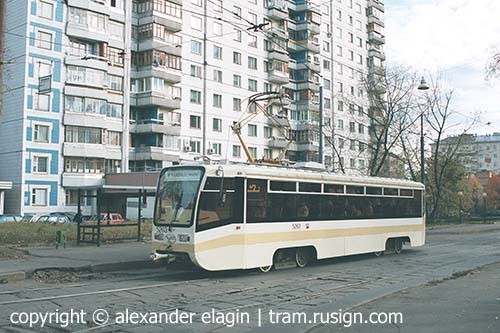 This tram #4210 has a special livery devoted to 75th anniversary of Oktyabrskoye depot. This rusty box once was used as a sort of schedule control device. I clearly remember drivers putting a card into a slot of this box and then pressing a pedal to stamp something on it, but these memories are from 1970's. This practice was abandoned later for unknown reasons. The stop named Sokolnicheskaya Zastava is served by route 4 alone, while the two other routes (13 and 45) terminate at the loop. Having seen this place three decades ago, I have to admit that today it looks slightly less livable, with those concrete buildings around. The tramcar is departing from the terminus. 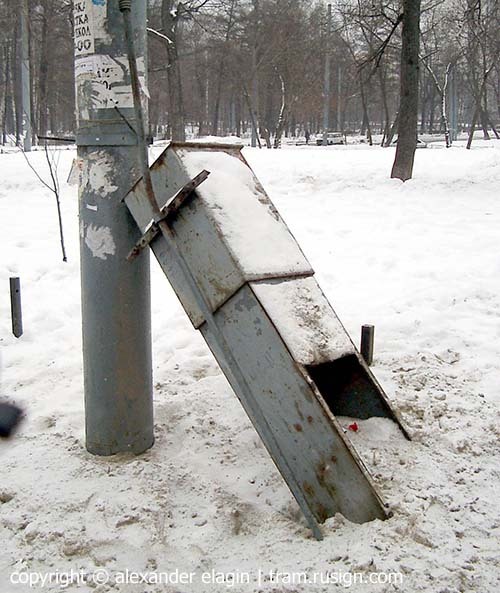 There is a main entrance to the Sokolniki Park to the right, obscured by trees. This junction you can see also in the next section, Oleniy Val.